Happy Easter everyone! This week’s Friday Finds comes all the way from a wedding at the Queen’s chapel in Windsor. This image was taken in the morning while Emma was getting ready. If people are ever doubtful about having photographs during the preparations I explain that even if they don’t display the pictures immediately, it’s not only good to have it recorded (you might not find it interesting, but I bet your future children or grandchildren will) but it’s also a great opportunity to get used to me being around. It means when all the important stuff happens later on, I’m already just a part of the furniture. So this was taken while Emma was having her make-up done. I will often frame photographs using people or objects. It’s a natural way to create a frame within the image and draws your eye into the subject of the image. It also feels more like you’re there when you’re looking at it, which for me is a key part of what I aim for with my photography. It can have other benefits though – people don’t instinctively react as they may not realise you’re actually taking a photograph of them. 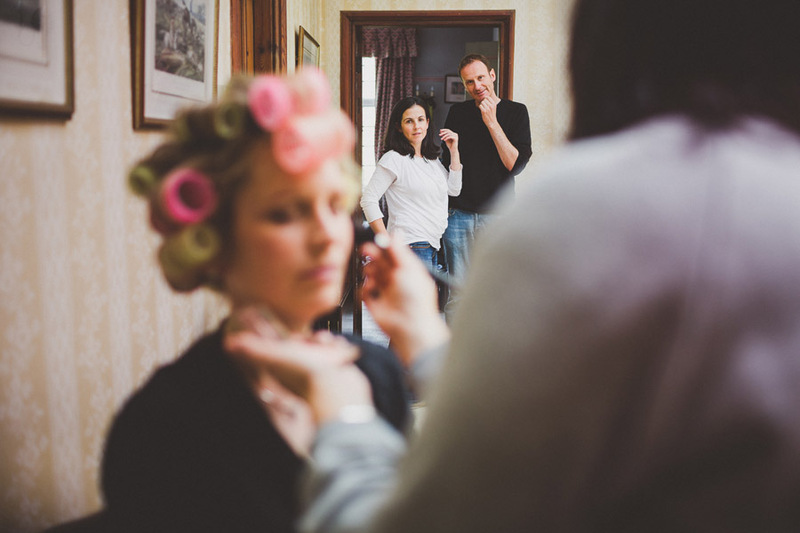 In this case, I caught Emma’s brother and his wife looking on while she is getting ready. They are both oblivious to the camera and so their poses and expressions are completely natural. Nice! The hand on chin is classic.